(October 15, 2000) The marketplace has spoken. Not even LB City Hall can keep its current version of Queensway Bay afloat on hot air alone. To its credit, City Hall has temporarily halted its lemming-style madness which threatened to drive taxpayers over a fiscal cliff. It will now reportedly reassess its current moribund plan. That's the right thing to do. When the Council last discussed QW Bay, one Councilmember actually thought he was defending the then-current plan by arguing, in effect, it was better than the current vacant lot. What a damning endorsement. LB deserves better. California's fifth largest city merits a unique attraction that befits our status as a beach city (our namesake for gosh sakes), something that evidence shows will attract tourists and locals instead just vacuuming their wallets and gouging locals for parking. Certain principles repeatedly prove themselves. We needn't copy them but we should apply them. The evidence shows tourists and locals want unique experiences and will pay for them. Universal Studios' "City Walk" succeeds by providing a clean, safe, upscale strolling atmosphere, a few rides and a view of the valley. It gives visitors a taste of something they can't get elsewhere: "the movies." It gets local revenue by offering area families and young people somewhere to eat, stroll, play and spend money. LB has a better view (one of the best on the planet): the Pacific ocean. We can provide a clean, safe, upsacle strolling atmosphere that combines a "City Walk" style ambiance, tailored to LB tastes, with something visitors can't get elsewhere: the classic California beachfront experience. Consider: Disney (not our favorite company, but we assume they do their homework) will soon open "California Adventure," which includes an attempt to re-create a California beachfront in smoggy Anaheim. We presume Disney knows tourists worldwide want the opportunity to experience a legendary California beachfront/oceanfront. It's an indelible part of popular culture worldwide, portrayed in movies and on television. LB has it, not some imitation, if we choose to make it so. Yes, that builds on the Aquarium's strengths. Yes, that invites a cleaner, more open oceanfront. Yes, that invites upscale restaurants. Yes, that builds on the nautical Queen Mary. Yes, that provides visitors for nearby hotels. And yes, a Smithsonian West museum would be synergistic with the nearby arts district. And just as Universal and Disney realize visitors and families want some original sizzle, LB needs to retore a classic California beachfront ingredient. 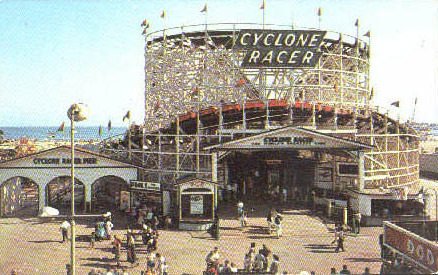 Over three years ago, entertainment executive Ken Jillson offered to rebuild LB's legendary "Cyclone Racer" roller coaster in perfect detail...and with his own money. For those unfamiliar, this was not some corporate theme park design. It was a genuine original, a California beachfront experience that can't be cloned in a corporate "theme park." It had sea spray on breezy days. It had ribbons of lights visible for miles along the coast. It had a wild configuration amplified by breathtaking ocean and beach views. Its specific design has never been duplicated. It is a California beachfront classic. No, restoring it doesn't mean rebuilding the Pike. It does mean doing what Santa Cruz and San Diego did. They cleaned out the sleaze (we've done that) and enhanced their beachfront and classic wooden coasters (puny compared to LB's), turning these areas into hip tourist venues with nearby restaurants and hotels. This summer, MTV chose San Diego's beachfront and coaster (viewed as classic and hip) as the backdrop for months of MTV's summer shows telecast nationally and beyond daily. What would LB give to have that tourist generating mechanism now? City Hall has drained large amounts from taxpayers in pursuit of a now moribund project. There will be time later to total the costs, tally the votes and list the quotes of those who ignored public warnings. Right now it's more important to do the right thing. If Mr. Jillson is still willing, with his money, to restore LB's classic California beachfront ingredient, City Hall should say "yes" and get out of his way. Whether his project is sited on the still unbuilt Bay or near the QM is less important than getting it done and reaping the benefits quickly. Meanwhile, City Hall should open diplomatic relations with Diana Mann and try to find common ground on environmentally sensible plans. That means confronting a new sacred cow: plans for a "cruise ship terminal." Opponents fear it could reverse progress made on cleaning up our waters and coastline. A city that values its beach and oceanfront -- arguably among our biggest assets -- wouldn't risk fouling them for financial reasons. Before progressing further, the Council (not the Port) has a duty to get the facts, examine them honestly and publicly, and go where they lead. We haven't seen Ms. Mann's Queensway Gardens plan so we can't comment on its specifics. However, in our view, open space should not be inherently inconsistent with an upscale, original "Beach City Walk," tailored to LB sensibilities, that highlights the ocean, includes classic California beachfront elements, adds a Smithsonian West museum if its curators agree and welcomes classy local outlets (as in Laguna) instead of endless cloned franchises. In other local media, some have suggested "downsizing" current plans for Queensway Bay. Shrinking a bad project is bad business and will only shrink the public's treasury further. We think it's better to produce what LB deserved all along: a quality, original, classy and classic California oceanfront experience that the evidence (not wishful thinking) shows will work.